Days in the Fulton County jail are highly regulated. Inmates are told when to rise, when to eat, and when to sleep. But a select dozen inmates don’t just follow orders; they give some, too. Specifically: Sit. Stay. Shake. On an overcast Saturday in March, 12 men clad in orange jumpsuits and navy slip-on canvas shoes sat on the edge of tan plastic seats arranged in a row. They were there for the start of an eight-week training cycle in the Canine CellMates program, which pairs inmates with dogs who would otherwise be behind bars of their own—caged at the Fulton County Animal Services shelter. During the program, the animals live in the jail, assigned to inmates who have been studying up on training. The inmates care for their charges and teach obedience skills. The dogs eat, sleep, and exercise with their handlers. Canine CellMates is the unlikely brainchild of a Sandy Springs boutique owner. Susan Jacobs-Meadows consigns designer clothes at Encore Boutique, but her passion is dogs. She launched the course in 2013, after studying established programs around the country. Her initial motivation was to save dogs from euthanasia, which at the time was the fate of more than 40 percent of those brought to the Fulton County shelter. She figured that obedience training, an otherwise pricey perk, would attract adopters. She was right. The program has placed 36 graduates, including Heidi, a collie mix now in training to become a service dog for an injured Alabama firefighter. But the Canine CellMates mission has expanded from saving dogs to supporting the trainers making the transition from jail. The recidivism rate for Fulton County Jail is about 70 percent, slightly higher than the national average. Of the roughly 70 inmates who have participated in the program, 20 have kept up with Jacobs-Meadows’s team. 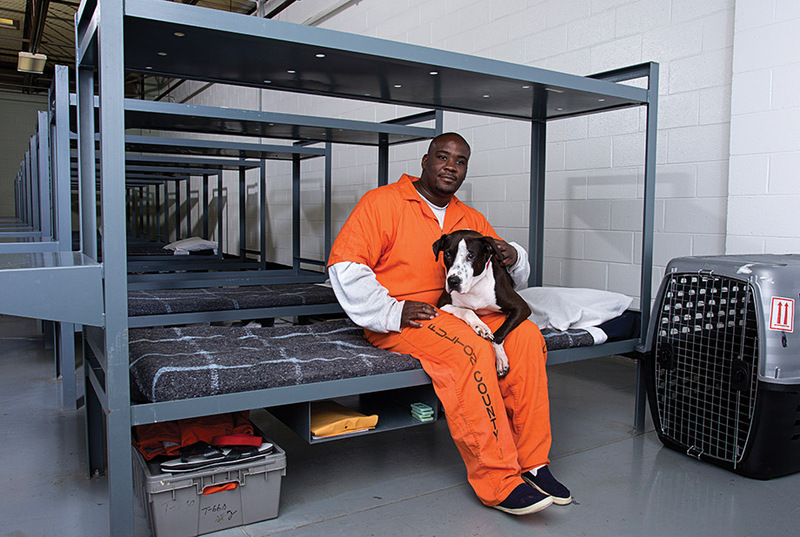 This allowed the volunteers to learn about the challenges inmates face upon leaving jail, such as getting a cellphone, clothing, or transportation lined up—“everything we take for granted,” as Diana Brace, a volunteer who heads Canine CellMate’s newly created Aftercare Program, puts it. So now, in addition to recruiting dog lovers, Canine CellMates solicits nonprofit partners to line up things like free computer usage and resume help. And as the men have come out and been successful at finding jobs and getting settled, they are helping, too. Brace says several now act as mentors to newly released men. Back in the cinder block room on the first day of training, that realization is just blooming as dogs and men meet. The inmates share observations about their new dogs with each other. “Look how she’s chilling,” says one. “That means we can approach.” One pauses while sweeping up dog hair to counsel another to be patient; progress will come. After just two hours, the dogs are more relaxed, and one determined trainer has even gotten his pup to sit on command. “The program is like a healing process,” says Sergeant Adams. When the men come in, “they don’t want to open up.” But the dogs help them do so. That’s what happened with Leon Jennings. 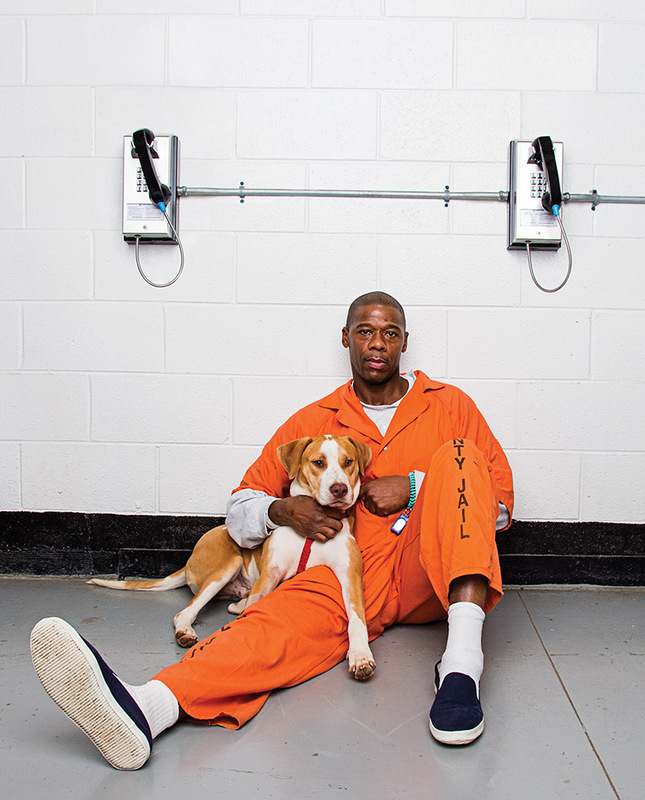 Jacobs-Meadows says when Jennings started with Canine CellMates, he “rarely spoke.” But the 40-year-old graduate of the training program now exudes warmth. A tall, friendly man, Jennings spent years cycling in and out of police custody. In 2014 he landed behind bars again, this time for shoplifting and parole violations. “For the first couple months, I just sat in my cell,” he says. “I didn’t want to be a part of the negativity in the jail, so I meditated.” Eventually he got accepted into Canine CellMates. Asked about it one recent afternoon over coffee, Jennings smiles at the memory. “It feels really good when a dog trusts you, when they reach up to accept a pat, when they follow your commands,” he says. Released in August 2014, Jennings now has a roof over his head and two paying gigs, one at a pallet company and another doing event security. The jobs keep him busy and cover his bills, including monthly payments he makes as part of his five-year probation. These days, he rises at 4:30 and walks to the train that carries him to work by 7. Mundane for many, but for those released from Fulton County Jail, Jennings is doing something monumental. When he got out, he started from zero: no ID, no birth certificate, no Social Security card. The Gwinnett County sheriff’s office has operated a dog handling program at its detention center since 2010. In 2013 the program was expanded to include cats, who are cared for by female prisoners in another unit. Find out more at jaildogs.org.